• Pilfer-Proof. Secure containment prevents pilferage; lowers replacement costs. Patented white roll-top tambour door is self-storing; no hinges to interfere with storage and transport, even when open. • No More Cart Covers. 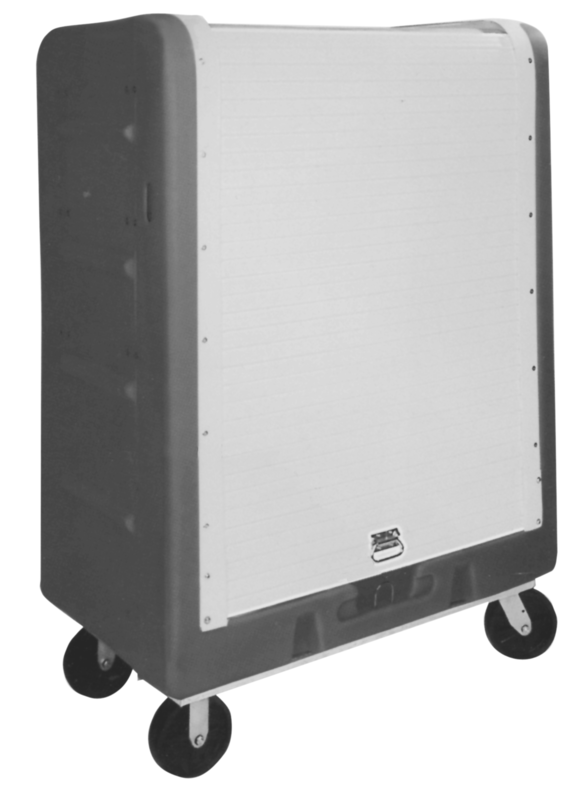 Goods stay sanitary and secure under the strong roll-top tambour door— made from the same durable polymers that resist weather and cracking in vinyl windows. • Lockable. Rugged hardened steel hasp can lock door tight. Hidden metal reinforcements add strength and security. • Adjustable shelving. Chrome-plated, heavy-duty wire or solid stainless steel; as many as needed, where needed. • Durability. Seamless, one-piece, molded heavy-duty polyethylene; resists cracking and breaking. Industrial strength, non-marring 8″ casters and steel base. Secure, rugged and adaptable.